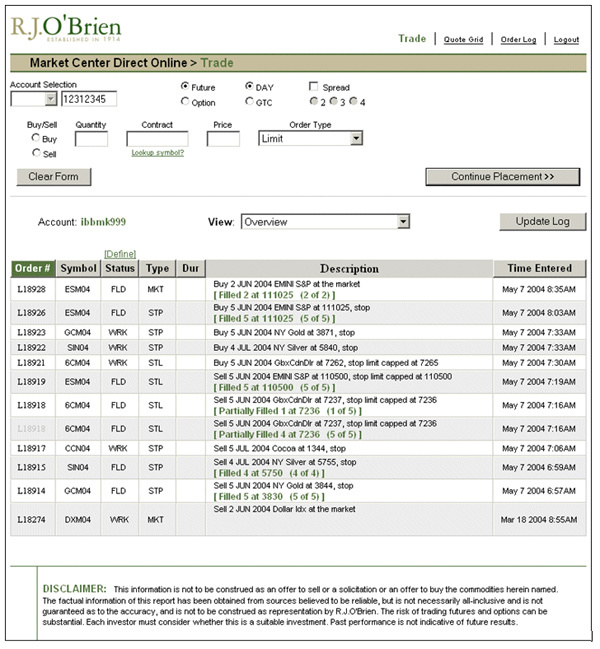 RJO WebOE (Web Order Entry) is a free firewall-friendly order-entry module that connects its users with access to the global futures marketplace. As a web enabled application, the product is suitable for any customer with a connection to the internet and a web browser. No special client configurations or installation of software is needed. Utilizing a series of dynamic web pages, this powerful application enables its users to place, change, and monitor order flow between a remote location, such as a user's home or office, and the financial markets. And, if you already have a quote and charting package, you can use WebOE in-addition, for a complete order-routing and execution experience. RJO WebOE is a straight forward, free trading platform that does not require any training and allows for futures and options traders to conveniently execute orders from any computer around the world.
.: Quotes: Access snapshot, real-time and last-tick quotes.
.: Depth of market (DOM) complete with “drag and drop” order entry: View current activity for a selected contract at various prices (CME Group, ICE and Liffe exchanges currently supported).
.: Dynamic User Interface: Mold and shape the interface by resizing windows, relocating and removing columns, and moving screens across multiple monitors.
.: Integrated Risk Management Screen: Access information on customer accounts using the upgraded marked-to-market account detail and risk management tool.